We are all looking for that next thing that will make us a better shooter, make it easier to know and follow the laws, and keep us better informed overall. In my opinion that “next thing” is on your cell phone and it is our company's no-cost mobile app. 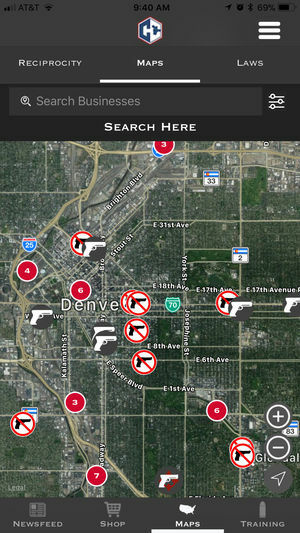 This past weekend our company rolled out the latest version of our mobile app called Concealed Carry Gun Tools. This no-cost mobile app is available for both iPhone and Android devices and brings you the very best tools we have. Our company initially launched our app back in 2015 however, if you ever downloaded it in the past and were dissatisfied, please try again! We spent the last 9 months completely redoing the entire app from scratch to bring it to full performance standards! **Before we share with you some of the top tools in the app it is worth noting that for you Android Users out there that already have our app installed, you will need to remove it and then freshly install the new app from Google Play. The New App is listed separately in Google Play (link below). 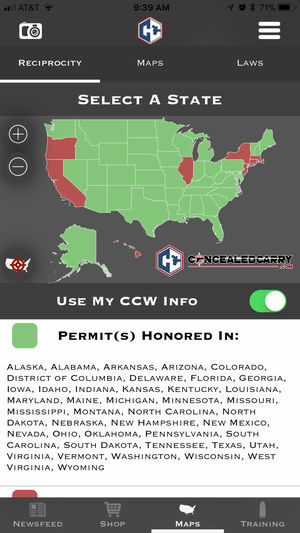 Unless Congress ever passes a National Reciprocity Act (and I'm not holding my breath) we will all have the need to know and keep track of what states honor our permit(s). There are a lot of websites out there with reciprocity maps but now you can hold your map in the palm of your hand. If you setup your free user profile, you can store your permit data in your profile and it will auto-generate your map each time without you having to select your permits. 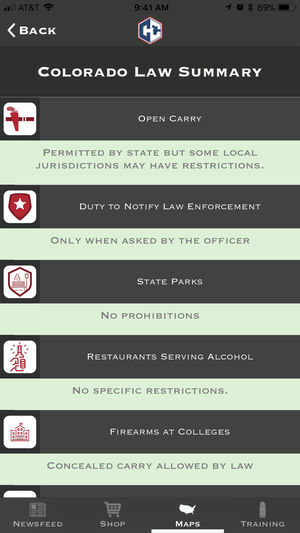 As you travel, just knowing what states do and do not honor your permit isn't enough. You need to know a lot of other things about your home state and any other state you travel to. This is a feature that is important to us that was very buggy in the older version of our app. Now it works really well. When you navigate to this part of the app it will auto-detect your current location and load the 10,000 businesses nearest you. Tap on any business icon to load additional information. Companies who which to edit or add their business to this directory can do so on our website. 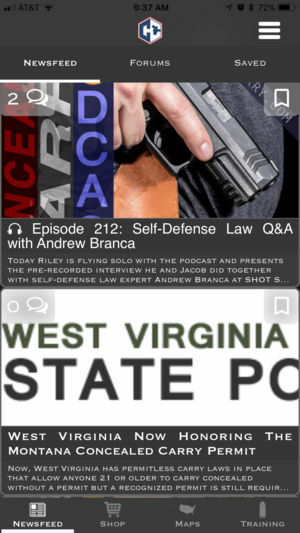 The most common thing people do on ConcealedCarry.com is read our articles and listen to our podcast. So it was important to us that we include that content in the app and make it as easy as possible to consume! The default “home page” when you open and launch the app is what we call the “Newsfeed” and it automatically updates with the most recent articles and podcast content from our site. You can quickly scroll down to see all the latest content. Right now there is not a way to comment on the articles but we are working on that for a future release. Specific to the Podcast Episodes while you can listen to them right inside the app we still recommend using an app on your phone that is designed specifically for subscribing to and listening to podcasts. In addition, tap on the “Forums” option at the top to engage in our user forums. You can start a topic, ask a question or chat with other gun owners! We see great value as a company in the logging of your firearm training and practice. Having the information about what you do, how often you do it, and at what level you perform will only help you get better. 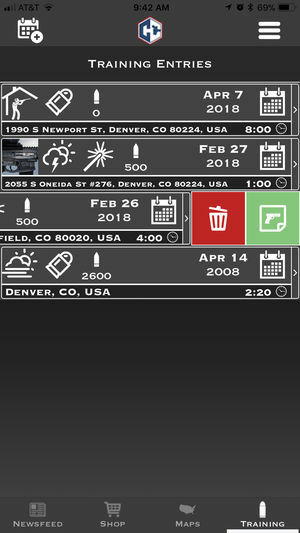 The training section of the app makes it easy to log your shooting. You can create an entry and input all the data you wish. Once you have your entry created, add as many logs as you wish. The log allows you to track your specific skill focus. Within a log you can add as many sessions as you wish. A session includes data such as the specific firearm used, number of rounds fired, grip used, targets used, and more. In addition to helping you improve many gun owners also log all their practice and training in order to combat potential allegations of negligence or recklessness in a future legal incident. Now that is a lot of features and you can see why it took us almost a year to redo it from scratch. If you find any bugs or issues please use our contact page to let us know. We would love to earn your five star review! Use the buttons below to download the app for your phone now! I have only spent a few minutes with the new app, but it is immediately apparent that this NOT a few tweaks to the previous app, but a brand new animal altogether! Looks great and navigating within the app is quite intuitive. … Now to uninstall the other apps I had been using to stay abreast of reciprocity and transportation issues when travelling. Thanks Charlie! Let us know if you have any feedback on where we can improve and be sure to leave your review and rating in Google Play or the App Store!